This article tells you how to Use FLV Extract and introduces a FLV Extract alternative. Just get it below. It is a free program that can save video and audio files in their original file formats without recompressing or decompressing. FLV files are becoming quite common due to video sharing sites such as Google videos and YouTube. Although, you may find specialized players for playing FLV files such as Media Player Classic provides the built-in support for playing such kind of files, yet the support for AVI format of the video is more common in software as well as hardware. You may convert FLV to mp3 using a number of programs. Some examples of such utilities are Any Audio Converter or Super. However, these kinds of software may require some complex operations such as re-formatting and quality. With the aid of FLV extract, the extraction process is quite instantaneous, and files also retain the format and quality with which they are encoded. The following procedure will show how to extract the audio and video in the FLV file. The first thing you need to do before using FLV extract is to download and then install it.Net Framework version 2.0. It is quite a large installation that will take almost half an hour, and will depend on your processor. 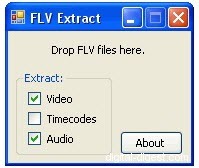 Once you are done with it, you are now ready to download FLV Extract. The steps for utilizing it are provided below. You need to drag your files to the FLV Extract where it requires, and it will then extract out the video as an AVI file and the audio is then saved to the mp3 file. 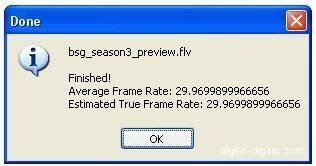 When the processing is done, the confirmation dialog will appear that will show the frame rate of the extracted video. In the same directory as the original file of FLV format, an AVI file should also exist as well as mp3 file of the same name as the original FLV file. Some other interesting features of FLV Extract are presented below. It doesn't require any kind of lengthy installation. It is sort of plug and play application. Just unzip and you are ready to use it. The user interface is bare minimum, containing only three options of timecodes, extract video, and audio. Simple drag and drop feature might be suitable for it. You can even drag multiple files into FLV Extract, and they will then be processed immediately within just a second (or at most a few seconds only). In short, you can say that FLV Extract is a wonderful little utility for those who love to deal in FLV files, and want to separate it into its components. Those of you who want to watch AVI files instead of their corresponding FLV formats; they may use the FLV to AVI conversion option that works very well. This software may not be directed at a broad class of customers, but it is still a handy little application. If you want to edit FLV files by splitting, merging, cropping, rotating, or setting transitional effects, we recommended Wondershare Filmora. It enables you to edit home videos with all common tools you'll need, and personalize your videos with rich text, filter, audio and transition effects for sharing on iPhone, YouTube, Facebook, etc. or burn to DVD.